C & B Equipment is a reputable company with a proven record of success with our customers. That’s because we ensure that all projects are done with the utmost professionalism ― using quality engineering to increase your company’s uptime. C & B is always looking to provide the most reliable parts and service to its customers. 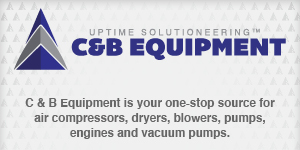 That’s why every single pump, compressor and engine from C & B comes with our Uptime Solutioneering™ guarantee. It’s the sum of our engineering expertise and real-world experience focused on making sure that your C & B purchase works and works…and works. It can start with recommending the right product for the application, providing advice on application engineering and can extend to engineering and manufacturing sub-assemblies to maximize performance. Uptime Solutioneering™, free with every order, and only from C & B. Contact C & B today and start turning your downtime into UPtime. Uptime Solutioneering™, free with every order, and only from C & B.